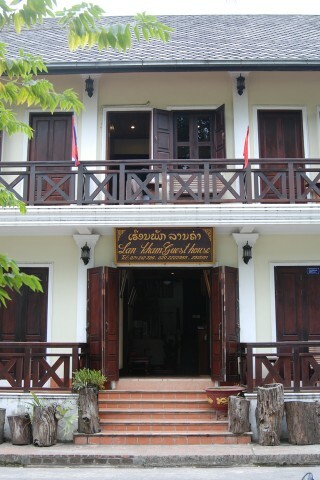 Lan Kham Guesthouse is a good little family-run guesthouse just across the road from the Mekong River and the multitude of restaurants that sit along the banks. Ad Book now! Rates from US$22++. Average rating 8.2 from 281 reviews. The look and feel of solid wood when you enter this guesthouse immediately points to a quality establishment and this is carried through to the bedrooms which are tastefully decorated with local fabrics. Bathrooms are still Lao-style wet rooms though and the rooms are smaller than we’d expect from a guesthouse in this price range, but they do come with satellite TV and free WiFi. Rooms #222, 299 and 289 on the second floor are the best as they have a skinny balcony overlooking the road and a partial view of the river through some trees. The thing we couldn’t get past was the price which was quoted at $45 – the same price as Mekong Holiday Villa which we highly recommend. If you’re having difficulty finding accommodation, this is an acceptable place but one that is overpriced.